Emerson Park Community Garden bee garden. At numerous talks to Master Gardeners and Garden Clubs we are asked many of the same questions. One of the main questions is “What are your top 5 or 6 bee plants that I should plant in my garden?” We hesitate to answer this question directly because we feel that it takes more than just a few key plants to really attract bees and other pollinators. We can offer suggestions on these few plants but prefer to provide information on a more complete program to those who would like to become habitat gardeners- by telling them how to provide food, water, and cover/places to raise young through sustainable gardening practices. One of the best ways to initially attract wildlife to your garden is to provide food. In the case of bees it’s with flowers that provide nectar and pollen. Hummingbirds are attracted to gardens that have nectar rich flowers like CA fuschia, salvias, and columbines. Feeders are also a good way to supplement their nectar needs, especially in months when there might not be much flowering. Hummingbirds also feed on small insects and you can often observe them eating them from spider webs in shrubs or trees. Birds are also common garden visitors and providing them with food can be easily done by putting up a bird feeder and planting flowers that provide seeds for them, such as sunflowers. Sunflowers also feed bees by providing them with nectar and pollen, and when the seeds form many different birds can eat them. When we talk with gardeners about attracting native bees to their garden we stress the fact that bees need floral resources (pollen and nectar) all year long. Adult bees feed on sugary nectar for energy. The pollen they collect is a protein and vitamin rich source which they will feed to their young. Nectar and pollen are combined to form a “bee loaf” that females provide for their larvae to feed on. Bees have seasonal emergence patterns, which means that different species emerge from their nests at different times of the year. Some species emerge in very early spring, February and March, whereas others come out later in spring as well as in summer and early fall. Bees have timed their emergence with the bloom of native flowers they prefer to forage on, but will also visit non-native ornamental flowers that may be in bloom at the same time. Some early flowering plants that provide food for bees includes: CA Lilac (Ceanothus sp. ), Manzanita (Arctostaphylos sp. ), Wisteria (Wisteria sp. ), and Pride of Madeira (Echium candicans). A female digger bee beginning her nest. Another key aspect to habitat gardening is providing cover and places to raise young. Most native bees are solitary nest makers and build their nests in the ground or in pre-existing cavities. This can be provided through nesting blocks or by leaving bare patches of soil or sand in your garden. In the Oxford Tract bee garden we have done a combination of things. We have bee blocks hanging under the umbrellas as well as bundles of hollow dried out sunflower stems to attract cavity-nesting bees (sunflowers have multiple uses in the garden!). Be careful when choosing places to hang nests. They must be out of the direct sun and protected from rain so they don’t get moldy. We also have oak barrels filled with both sand and soil for ground nesting bees. 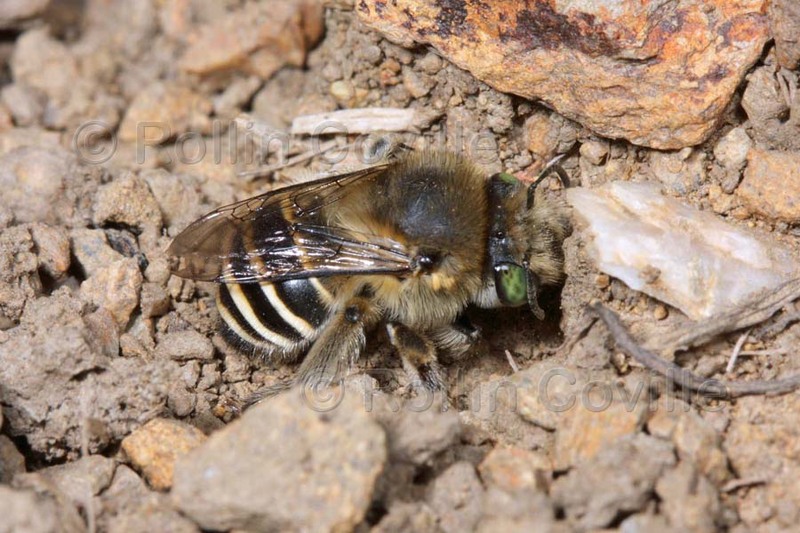 Bees have also been seen nesting in soil banks where they can easily dig through the dirt. If you are a “mulcher” make sure to leave some bare dirt areas because bees will not dig through a thick layer of mulch. Other garden visitors need places to raise young as well. Bird and bat houses are easy to build and can provide protected areas for nests and roosting. Bat houses should be mounted 12-15 ft. above the ground and protected from the wind and are most successfully colonized if you live close to water. Birdhouses can be mounted anywhere from 5-30 ft. above ground. Not all birds have the same nesting preferences so set up many houses in different parts of the garden to have the best success. Plants can also provide places to raise young for insects like butterflies. Butterflies need larval host plants for caterpillars to feed on, like milkweed (Asclepias spp. ), if you want to attract Monarch butterflies to your garden. Research the wildlife you see in your garden in order to pick the right plants and provide the best nesting requirements. Cover can be provided in the form of thickets and brambles, as well as with log or rock piles. Bird bath in the Oxford bee garden. Water is also a key resource for wildlife and there are many ways to provide this. Birdbaths are easy to make and can provide many species with a place to clean off. Not only will birds bathe in these baths, but they (and other animals) will also drink from them. Place them near windows so you can watch them as they fluff up and take a dip. Creating a pond can also be a great way to provide water to the wildlife in your garden. Be sure to monitor ponds as they provide habitat for mosquito populations. Puddles can also attract butterflies, honey bees, and bumble bees that will sip water and extract minerals and salts from the soil. Garden design is also important when planning your habitat garden, especially with the goal of attracting native bees. We have found that large patches of one single plant type are the most attractive to bees as well as butterflies. If you have the space, a patch size of at least one meter by one meter should be designated for each plant species. The patches provide more resources (nectar and pollen rewards) and allow bees to forage in one spot for a long period of time. If plants are scattered it means bees have to spend a lot of energy flying from one plant to the next making them less efficient pollinators and harder to observe at work in the flowers. As well as having large patch sizes of flowers, diversity is also important. Native bees are more likely to forage on native plants, so the more diversity of plants the better. We have repeatedly observed that the more varied gardens contain more diversity and abundance of bees as well. There are many attractive non-native plants, but selection of these should be careful. For instance, roses are not good bee plants because they have been bred to produce many showy petals replacing anthers, the reproductive parts of the flower, which is where bees get pollen. Providing all these resources for the wildlife in your garden will all be for naught if you aren’t employing sustainable gardening practices. Having a healthy garden will benefit the soil, air, and water, which will then in turn benefit all the critters in your garden. The use of pesticides will be harmful to all the animals and especially insects that you are trying to attract. There are natural home-made remedies that can be used to help rid your garden of pests. Some insects that you may consider pests, like wasps, are actually beneficial because they feed on some of the damaging caterpillars, hornworms, and flies. You can even purchase ladybugs to feed on the aphids in your garden if you have a bad infestation. Some other sustainable gardening practices that should be considered and practiced include: composting, limiting water usage, capturing rain water, using native plants that are adapted to your area, and using organic fertilizers. Consider getting your garden certified as a wildlife habitat through the National Wildlife Federation and join us in becoming one of over 100,000 certified habitats! Gaillardia 'Oranges & Lemons' with an ultra green sweat bee. Now that we have given the home gardener some tips on habitat gardening we would like to offer specific recommendations on what to plant throughout the year. We have stressed the idea about providing both nectar and pollen, but some of you may not be familiar with the specific resources that plants provide. This will help guide you in determining what flowers to plant and their main flowering periods. Look for plants in nurseries a month or more before they bloom. If starting from seed you will need to start them well in advance, sometimes up to 6 months. Flowers that provide both pollen and nectar are a necessity for your bee garden (see above in Habitat Gardening section for explanation). Plants in the Asteraceae (Compositae) family provide both resources and there are numerous native and non-native flowers to choose from. Imagine a sunflower (Helianthus annuus), this is a typical Asteraceae flower that is made up of both disk flowers (the tiny flowers in the center) as well as ray flowers (the larger petals on the edge of the flower). The center of the flower is where the bee gets nectar and pollen. If you see a bee inserting its’ proboscis (tongue) into the disc flowers, it is most likely collecting nectar. If the bee isn’t taking a drink it may be “dancing” around on the flower collecting pollen, which it will pack onto its’ hairy legs or abdomen (some bees even ingest pollen to be regurgitated later). After watching bees drinking and dancing on flowers it will become more evident as to the resource they are after. Flowers in the Asteraceae family are good for bees because they don’t have to work too hard to get what they want. The flower presents its resources on a pedestal and even gives the bee a nice landing area. One family of plants that provides a good source for nectar is the Lamiaceae (mint family). These flowers, made up of five fused petals, are usually irregular in shape, have square stems, and are usually quite fragrant. Bees will hang on the outside of the flower and insert their proboscis inside to gain access to the sweet nectar. Many of the herbs that we like to cook with, like basil and lemon balm, are in the mint family, so not only do they provide us with food, but the bees as well. In our garden we have also observed a few flowers that only provide pollen as its reward to bees. 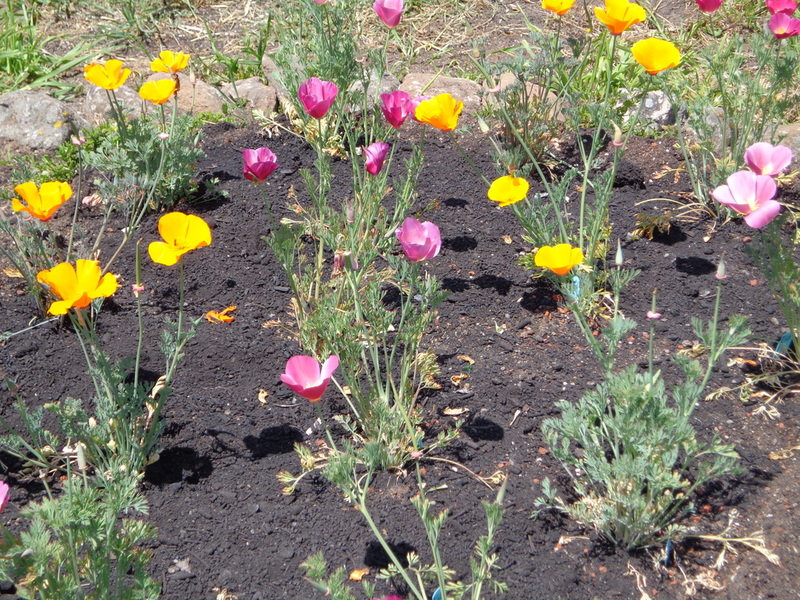 For example, the California Poppy (Eschscholzia californica) is very popular with bumble bees, as well as with honey bees and sweat bees (halictids), which roll around in the flower gathering as much orange pollen as they can. Another flower in our garden, Solanum spp., provides only pollen through which the bees must gather by vibrating the flower (“buzz pollination”). Bees, mostly larger ones like bumble bees, vibrate while holding onto the pollen cone and the pollen grains are released through terminal pores in the anthers. Interestingly, honey bees don’t have the capacity to buzz flowers. 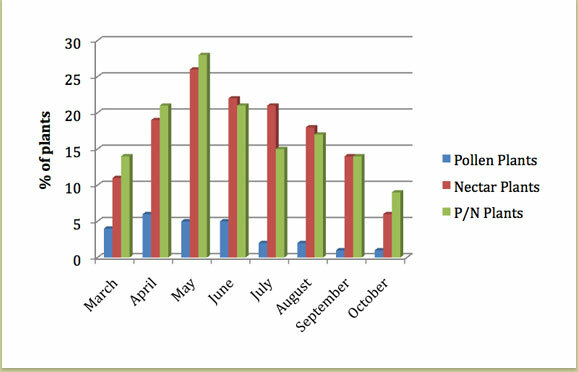 The following graph provides the home gardener an idea of the time of year when certain plants (pollen, nectar, pollen/nectar) should be available to bees. 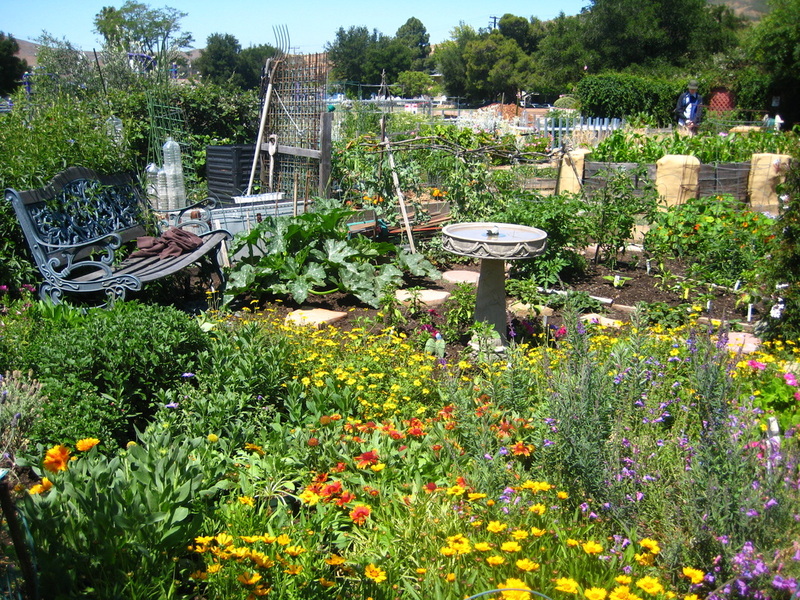 It is based on findings from our experimental bee garden at the Oxford Tract in Berkeley. Please note that our garden is larger than most home gardens, at 16ft. x 185ft. We also have the ability to plant a wide variety of species, both native and non-native, in our garden, ~120 species to date. Make adjustments as to the size of your garden, but try to incorporate at least 15-20 different species even in the smallest of gardens. As you can see the peak time in which most flowers should be available is in late spring and early summer. This also corresponds to when the highest diversity of bees can bee observed. 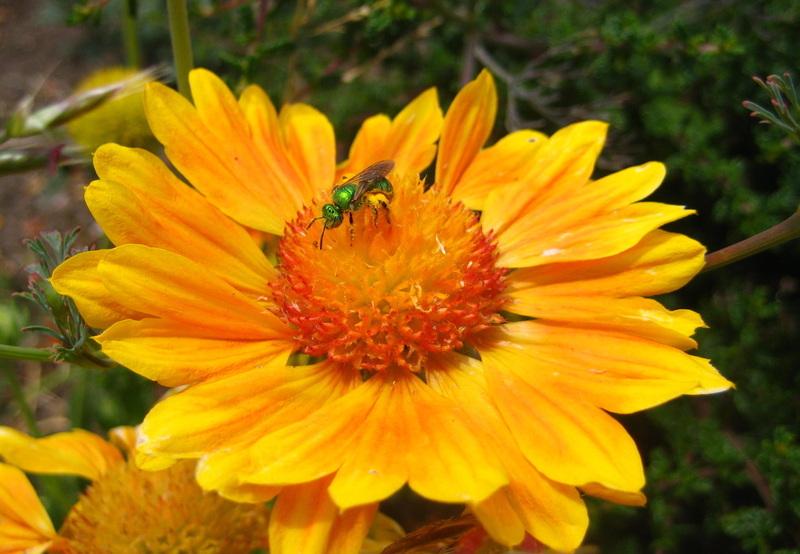 California natives tend to flower more in early spring and summer, whereas non-native ornamentals bloom mainly in late summer to fall, so a combination of both would be ideal for attracting the highest potential diversity of bees. Pollen/nectar plants and nectar plants are the most abundant all year while pollen only plants represent a small, but important, percentage of the flowering plants. 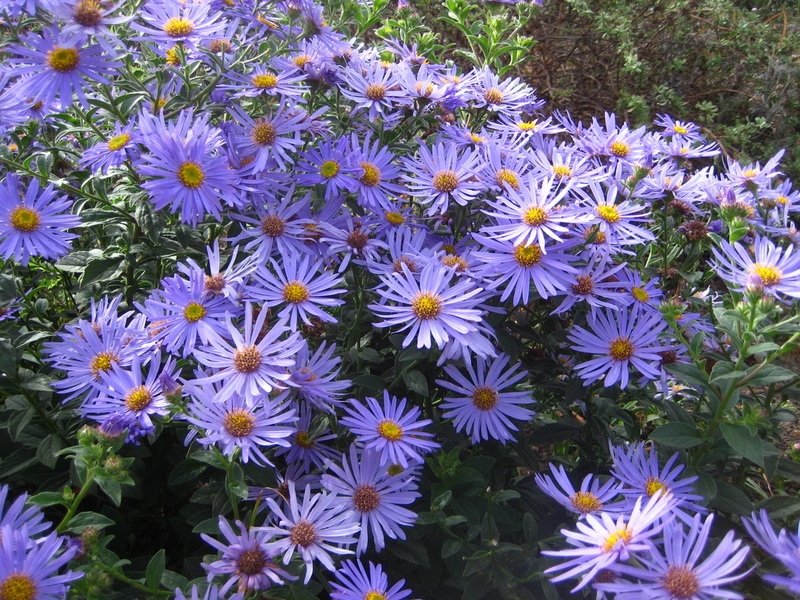 A patch of Aster x frikartii (Monch). A lot of these flowers will bloom into the next season (i.e. from summer through fall) and with careful management you can extend flowering times. Dead-heading spent flower heads encourages more bloom for a longer period, and we often do this on plants such as Cosmos bipinnatus, C. sulphureus, Grindelia stricta, G. hirsutula, Gaillardia x grandiflora, Erigeron glaucus, Aster x frikartii, Encelia californica, and Coreopsis grandiflora (which are all plants in the Asteraceae family). We have also experienced a longer bloom time on some native plants with a little extra watering (Verbena lasiostachys), though this is not always recommended during periods of drought. The next step of starting your habitat bee garden is the design. Where and how do you arrange all the plants that you have? First you must consider the size of your space, do you have a small area in your front yard, or a much larger space in which to freely plant as you’d like? The types of plants you will incorporate into your garden will depend on the size of your garden. Investigate the plants you want and find out how large they will become at maturity before placing them in your garden. If you have a small space you may want to stick to small/medium perennials with open spots for small annuals. If you have more room you can plant larger shrubs and even some small trees that will not only provide food resources but cover and nesting resources as well. Most of the plants we recommend do best in full sun, with the exception of a few shade tolerant plants like chinese houses (Collinsia heterophylla) and hummingbird sage (Salvia spathacea). The following is an example of what you can do with a front yard 30ft. x 30ft. garden space. Plants are a combination of native and non-native and selected to provide flowering throughout the “bee year”, March-October. Taller and larger perennials are on the edges of the garden so that the smaller perennials and annuals are not hidden from view. 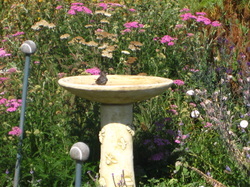 A bird bath provides water for all the critters. Bee nest boxes could be hung underneath an overhang or some place where they can be protected from the elements. Place large rocks or stones in any bare spots to provide a landing spot for butterflies to warm themselves. Try not to mulch and leave bare soil exposed for ground nesting bees. It is our hope that gardeners will want to run with this idea of habitat gardening and think about gardening in a more hollistic way. We have provided a lot of information to help you get started. 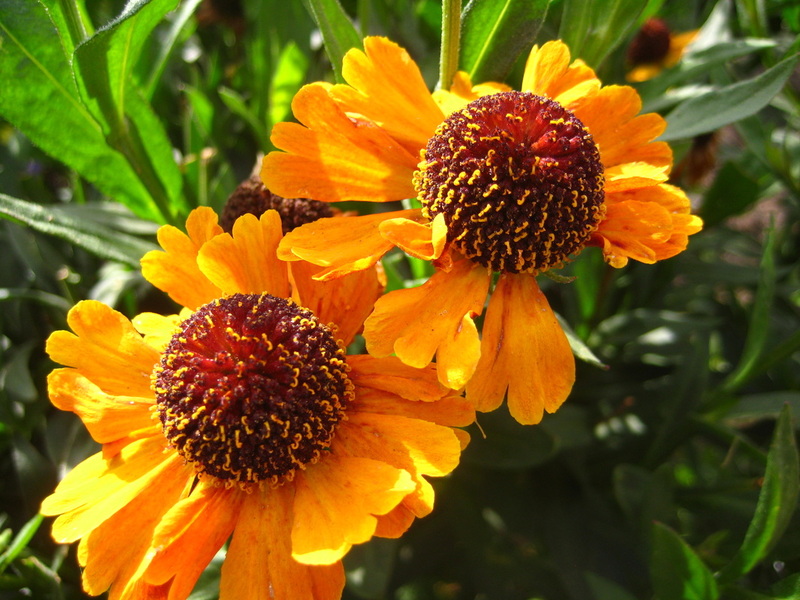 Many nurseries throughout California will be helpful when searching for these plants. We have good working relationships with many nurseries including Annie’s Annuals (Richmond), Berkeley Horticultural Nursery (Berkeley), Mostly Natives Nursery (Tomales Bay), Native Revival Nursery (Santa Cruz), and the Santa Barbara Botanic Garden (Santa Barbara). Together, these nurseries will have all of the plants listed above. Consult the following references for more information on the above species as to their size, flower color, water, and possible soil requirements: Sunset’s Western Garden Book, Annuals for Northern California by Bob Tanem and Don Williamson, Trees and Shrubs of California by John Stuart and John Sawyer, Plants of the San Francisco Bay Region by Linda Beidleman and Eugene Kozloff, Introduction to California Spring Wildflowers of the Foothills, Valleys, and Coast by Philip Munz, Flowering Plants of the Santa Monica Mountains, Coastal and Chaparral Regions of Southern California by Nancy Dale, the California Native Plant Society (www.cnps.org), and Cal Photos for pictures of native plants. Also, the above plants will also attract other flower visitors besides bees. For example: Rudbeckia spp., Aster spp., Coreopsis spp., Ceanothus spp., Collinsia heterophylla, Erigeron glaucus, Eriogonum spp., Monardella spp.,Scrophularia californica, and Epilobium canum are all butterfly plants. Hummingbirds will visit hummingbird sage (Salvia spathecea), CA fuschia (Epilobium canum), Salvia ‘Indigo Spires’, Pride of Madeira (Echium candicans), and Salvia ‘Hot Lips’ (Salvia microphylla ‘Hot Lips’). A number of beneficial flies and wasps also visit many bee plants, especially all the different kinds of native buckwheat’s (Eriogonum spp.). Have fun experimenting with different plants and flowers and enjoy watching all the wildlife that will soon be visiting your garden!